Mike had a hiding place prepared for them once they were on the ship, but before he could take them to the closet located in the bottom level, Ana and her brother needed to hide in an empty oil tank while a final search of the ship was performed before setting sail. Ana remembers, “While remaining perfectly still, kneeling in a thick layer of sludge, my brother and I could hear the soldiers walking on the oil tank and see the beams of their flashlights penetrating through the cracks, but God again protected us. Soon, I heard a whistle from Mike indicating the coast was clear.” They were able to crawl out of the oil tank and sneak to the small, dark closet that was their cocoon for the next eight days. When they arrived in Greece, the three snuck off the ship at night and sojourned across Greece into Yugoslavia where they were caught by police and sentenced to three weeks in prison for crossing the border illegally. They were then released with instructions to travel to Italy. Once in Italy, the American Embassy graciously granted political asylum for them to come to the United States which became their home for over 33 years! In 1989 Mike and Ana began serving at GT in Reading, PA.
After their harrowing escape from Romania, why would Mike and Ana want to ever return? Ana simply but passionately says, “Since the fall of communism we feel compelled to take the gospel of Jesus to the Romanian people.” They have done many missions trips back to the very country they had fled and were struck by a shortage of ministers to disciple new converts. It was this need for leaders that prompted them to answer the call to full-time missions. Leaving their secular jobs of business and nursing, leaving their three children and grandchildren, Mike and Ana returned to Romania and are planting churches, training leaders and serving in the unreached region of Southeast Romania. My last post seemed to generate some interest so I am following it with this which occurred Sunday night. I do believe that the discussion and implementation of missional ideas and practices is just beginning. Experimentation and retooling are words we had better get used to. The fact is that unreached tribes make up most of our culture. When we focus on being attractional we see these tribes as competition because we want them to leave their tribe and join ours. But that’s not how successful missions work accomplishes the goal of growing the kingdom. We cannot merely put on native clothes in order to infiltrate the new tribe. We must have genuine love for people, and be willing to spend time with them. Our Faith in Action team of 25 (including teens and children) met at 6 pm for prayer and the Word before heading out on four mercy missions. I shared Luke 14 -the Parable of the Great Supper -to give foundation to our task of going into the highways and hedges. We also included our prayer team, who remained at the church to intercede for our work. Space does not permit me to elaborate on the amazing God moments experienced by the three smaller groups we sent out. 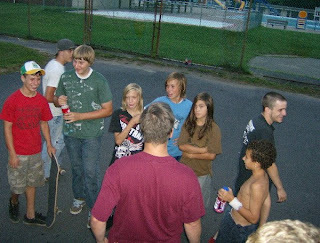 But the group I was leading discovered a second lost tribe of young people at a local skate park. It resembled “Lord of the Flies” as there were no adults in sight, and there was an aboriginal feel to the place. We first set out for the park where we discovered the “Ultimate Fighting” tribe a few weeks ago (see earlier post). They were nowhere to be found. So we cleaned up the park again and talked and prayed with a group of five who were playing basketball. They seemed embarassed, but grateful as we gave them each a 20 oz. ice cold energy drink. Next we headed to the skate park. A notoriously dirty and dangerous place. 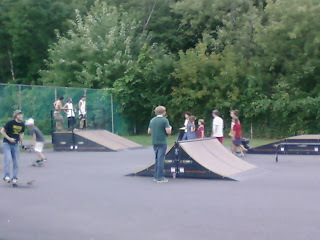 It was filthy, but the tribe of about 30 skaters between the ages of 11 and 20 seemed oblivious to their surroundings. We began sweeping and picking up, waiting for a chance to speak with some of them. We had only 19 energy drinks to give out, but with 30 kids there, I was afraid giving them out would start a riot, so I began to ask the Lord what to do. I proceeded to ask them general Bible questions off the top of my head. “Who was Moses and what was the most important thing he did?”, “Name one thing Jesus said,” “Who was Judas and what did he do?”, and so on. It was electric. These kids were thinking and talking about God. One kid recited the entire Lord’s Prayer. They came up short on John 3:16, but it gave me a chance to tell them about it. The spontaneous atmosphere, and incarnational character of what we have been doing opens the door for the Spirit to do more than if we had stayed in our church box. It also gives more value to the times we do meet for worship and teaching because that’s where we get fueled for the mission. As we were leaving some of the boys came and said thanks for cleaning up, and for the drinks. I am hoping they will begin to take pride in the place and keep it clean themselves. Then one of the boys, who was wearing a Led Zeppelin t-shirt, came up to me and said, “I think you were my pastor when I was a kid.” I thought he looked familiar, and it turned out to be Georgie. His family had left the church in a split a few years ago, but George always sat up front and loved to be in church. It was great to reconnect with him, and I think something stirred in his heart. I know something stirred in mine. Many of us have been reading a lot over the past few years about the missional church and how to reach our culture. It is obvious that things are changing rapidly, and we are lurching farther and farther away from the type of church we grew up in. We are clearly at the place where we must be true missionaries who bring the gospel to unreached people, rather than trying to return the culture to a church they never really knew. In light of this new reality many have spoken of the tribalization of our culture. We are no longer a homogenous “American” culture, but rather a panoply of tiny and distinct tribes. From skaters to goths and from Nascar to NY City arts types, not to mention the many ethnic groups, we seem to be coalescing around fairly narrow personal interests and affinities. The trend is accelerating. The church is seen as a separate subculture all it’s own, with numerous sub subcultures. This has profound implications for us in pastoral ministry as we move away from a purely attractional model. Mountainside began a bold experiment (bold for us, anyway) this summer as “Faith in Action” was born. We morphed a successful in house small group ministry into a team mission approach to reach our own community. The tiny group of 8 who began with us a few months ago has swelled to as many as 32 as we branch out every Sunday night to perform acts of service for whoever needs help. The focus is on the unreached, though we help church folks too. There are no strings attached, and we have not pushed or promoted our church at all. We do pray with people (they almost always cry grateful tears when we do) when we are done, but prefer to wait for them to ask us why we are doing what we are doing. We have had some visit our services, and one single mom has already surrendered to Jesus. Teams then gather at a local eatery to discuss our excursions and share what God did each night. This past Sunday I took a small group of teens to do some street sweeping and trash pickup at a local playground. 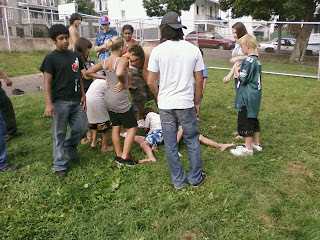 As we drove up we were surprised to find a large group of about 35 teens and younger kids gathered on a grassy patch. They were cheering and we noticed two shirtless teens wrestling in the middle. At first I thought they were just wrestling (Shamokin is a wrestling town), but as I spoke with some of the boys, I found out it was their own version of “Ultimate Fighting”. There is no punching, but choke holds are allowed, and you either pin your opponent or they have to “tap out”. They alternated matches between older teen and pre-adolescent boys. There was not an adult in sight. I have an extensive history in amateur wrestling and I am not a big fan of the more brutal forms of the sport. Much like missionaries to Africa were forced to overlook the nakedness of primitive tribes in order to be accepted by them I had to withold my criticisms and safety concerns in order to engage the members of the tribe in conversation. I was able to meet a few members of the tribe and set the stage for a return visit in a few weeks. Shamokin is a difficult mission field. The city is facing bankruptcy and everything good is shrinking, while negatives abound. We have seen 4 churches close in the past few years, with many others holding on for dear life. The situation is dire. Any strategy to see this community transformed must be long term or we should really not bother. Single events or splashy presentations will not make a ripple. Missions work is not for the faint of heart or glory-seekers. If we had been holed up in church that night we never would have discovered this “lost” tribe. Now we must pray for an open door for the gospel. The need for our being there is acute as we seek to gain their confidence and provide a redeeming presence. Ralph Winter is certainly one of the top evangelical missiologists in America, so I was interested to recently read this article warning of 12 missions “mistakes.” I wish the text were longer, because a few of them left me scratching my head. Maybe someone can elucidate me. I got this from evangelist Tim Enloe. It’s the history of world religion in 90 seconds from a website that normally maps wars, of all places. It is oversimplified, of course, but nuancing would probably take, well, a little longer. I heard Ed Stetzer share this week regarding the epicenters of Christianity throughout history. The heart of the church moved from Jerusalem to Antioch and then to Athens and Rome. From there it has moved throughout Europe, Southern Asia and then to America and now it is largely a movement in the Southern Hemisphere. Just moments after hearing Ed share this, I received this email from my friend Christopher Alam. “Christianity began as a personal relationship with Jesus Christ. When it went to Athens, it became a philosophy. When it went to Rome, it became an organization. When it went to Europe, it became a culture. Many of you are already in relationship with or have heard of Johannes Amritzer from Stockholm, Sweden (http://www.missionsos.org). Early this year I heard Johannes give a great teaching on “Becoming A Priest To Those Who Don’t Go To Church.” Like me, I’m sure you’ll find something to apply. – It is not enough to have respect and influence inside of the Church; we must have the same influence outside of the Church! – Abraham walked in the land that he “would possess” as though he “already possessed it!” We must move through the land that God has promised to give us as though He has already given it and we fully possess it! It is ours! – Paul could move throughout the pagan city without it affecting his testimony. There was no compromise within him. – He wasn’t taken in by the city’s carnal attractions, nor did he remain aloof like some “holier than thou” visitor. Instead, Paul was able to observe the needs of the city without it exciting his unrighteous or self-righteous flesh. – If you do not have a disciplined spirit you’re not ready to move forward in church planting. – He gave value to all people, both in the synagogue and in the marketplace. – Once you are regarded in their eyes, they will open the door for you to share. – He related to them by touching something that was important to them! – The rest is in vain if we never present the Gospel. – The focus is always on disciples, not simply decisions. Yesterday, our Catalyst group had the privilege of hosting Christopher Alam, a long-time missionary evangelist who has planted over 1000 new churches and has seen millions of converts in Africa and Asia. Just last week he was received into the Penn-Del District of the Assemblies of God (his close friend, Reinhard Bonnke, was received into the Peninsular Florida district this month as well). One of the group members asked Christopher what an American pastor should do to keep their faith level high that God can/will do the same kind of miracles here that are happening in many other places of the world. I was struck by Christopher’s answer. What do you think? Has that approach been effective for anyone?